He woke in a soft bed with warm, woolen blankets pulled up to his chin. The mattress was made of feather and seafoam, or so Paul gathered by its softness. Somewhere he heard a fire blazing and felt its heat on his face. The dark began to peel away and he saw movement, an old man bent over with a cane for support. He wore the blue robes of a physician and knew instantly where he was. “Thegn Urval?” he croaked to his father’s personal physician. “Oh, yes,” Urval said with a grunt. “She brought you here on Rock.” She carried me all the way to Hallow Hill on Rock? The thought made his head reel and he lay his head against the wall of etched stone. “Jack’s alive?” he asked, bewildered. When she came, she looked different. Her hair was clean and brushed, but shorter than before. It hung just below her ears and small braids kept it out of her eyes. She wore a dress that tickled Paul’s memory, but he couldn’t place it. My mother’s, maybe? The blue suited her. He sat up and found the pain was barely there. Paul’s heart leapt, first at the contact and then her words. “Is he still ill?” She licked her lips and opened her mouth but the door opened, Jack stepping through. The tall young man stood just inside, shutting the door behind him. He wore blue enameled mail and a breastplate, his hair slick with sweat. A cloak of brown hung around his shoulders, though a gray cord was knotted at its clasp. He’s been acting in my stead. Paul couldn’t help but notice how Jack couldn’t meet his eyes. His father lay in bed, his skin gray and hair thin and white. Paul had never seen his father so weak, so frail. The last time he’d seen him he had been sick but never this sick. He’d always been a strong man. But a son’s eyes see his father as stronger than he is, Paul reasoned as he knelt at his bedside. Dried blood crusted his father’s lips and beard, staining it pink and yellow. His father’s eyes were glassy and searching and Paul knew then that he was blind. With a look to Tani, who nodded, he knew that this was the end. He took his father’s hand in both of his. “Father,” he said quietly, trying not to let his voice shake. Gareth Halloway blinked and turned his head, cracked lips moving as a hoarse whisper escaped. At first there were no words, only indecipherable murmers. Then his father coughed so violently that his body shook and fresh blood shot from his mouth. Tani reached over with a rag and wiped at it. Paul looked at her and felt his heart clench. My father caused so much suffering in her family and yet she helps him. He swallowed and watched his father as he struggled to breathe. He prayed to the Destroyer to wait, to allow him life for just a little longer, so that he could tell him what he’d done, to be absolved. “Not yet father,” Paul whispered. “I have to tell you something. I… I failed father. You sent me to be a man and I failed.” The admission came pouring from him, each word felt like weight pulling off his shoulders. The pain ebbed in his ribs and Paul felt renewed as his story came out. He told his father everything, from leading his troops out to hiding in the bushes to Bearkiller at Tani’s farmhouse. When he was finished, he found that he was crying, begging for his father’s forgiveness. Tani had a hand on his head, smoothing his hair. “Your son fought the big man to save me, my lord,” Tani told his father. Paul looked up and his father’s eyes were looking up at the ceiling, his lips moving but saying nothing. Then his father slipped his hand from Paul’s and placed it on his head, and with great effort, raised the other to Tani’s. “There is greatness in you both, but not where you expect it,” his father said in a whisper. “I can see it, just as I can see the sun rise. My son,” he said, his head turning towards him, those blind eyes looking far away. “Do not dwell on your regrets, as I have done. It will destroy you as it has destroyed me,” and as if to prove his point, his father coughed violently again, his hands falling from them. Blood came rushing from his lips and his body shook and shivered. Tani leapt for a potion bottle she’d placed next to the bed but it was too late. As the shivering subsided, his father’s breath was gone, his last words coming through a bubble of his own blood, “I’ve a wife to see, be a good boy and fetch my horse.” And then the Lord of Hallow Hill died, leaving Paul grieving at his bedside. 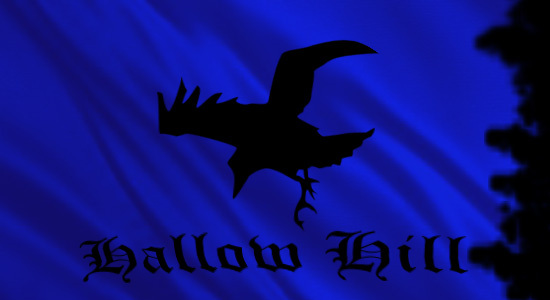 This entry was posted in Fantasy, Original Fiction and tagged Fantasy, Hallow Hill, Mike Kern, The Saga of Aranor. Bookmark the permalink.